Gateway Capital Holdings/GCH Consulting has signed musical group "One Third" to their management roster. The group which consists of Alpheus 'Al' Johnson, Miguel Walters and Adrian Campbell, rose to prominence after winning the Digicel Rising Stars competition 2006 and began discussions with GCH for management representation in June of 2009. 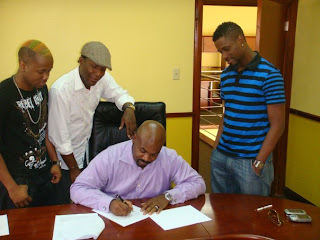 The group which was previously managed by Ray Alexander, who is sometimes referred to in Dancehall as the "bald-headed Ray", says the new agreement with Gateway Capital Holdings/ GCH Consulting for management representation and artist development is "something we have been wanted for a really long time. We have a great team assembled and we know we are going straight to the top." One Third initially billed their sound and style as the 'next Dancehall group', but after a few the years, the group of talented young men have proven they are capable of delivering any genre of music. According to the group, "We intend to do a great blend of reggae, Dancehall and other genres and take music to the world." Gateway Capital Holdings/ GCH Consulting Partner and Head of Entertainment Terrance T. McCormick said, "We are delighted to be working with "One Third" in helping to take their career to the next level and we look forward to working with the group to deliver their unique sound and talent to the world for many years to come."